On Wednesday, members of Council and I announced that the Township hopes to participate in the upcoming auction to purchase the bankrupt Woodcrest Country Club. This 155-acre parcel of undeveloped land is an important piece of our community and should be preserved in perpetuity as open space. The Township has reached out to the Camden County Board of Freeholders requesting their assistance in helping to secure the funds needed to put forth a competitive bid for the property. Regardless of whether we emerge as the winning bidder, Council and I want to stress the fact that we do not, and will not, support a change in zoning from the property's current institutional designation. Read all about Wednesday's announcement, including the full text of a letter sent to Woodcrest and adjacent neighborhoods this week, by clicking here. If you recently moved into Cherry Hill, or if you just want to meet new people and learn more about services and activities available in the Township, please join us for a very special "Welcome to Cherry Hill" open house, from 6 to 8 p.m. Wednesday, April 10, at the Cherry Hill Public Library. Council and I will be on hand to meet attendees, and information will be available on Township services, community groups, places of worship, athletic organizations, swim clubs, and much more. Special presentations from the Library, Cherry Hill Schools, and the Police and Fire Departments are scheduled from 6:30 to 7 p.m. Meet your neighbors, sign your children up for a free Kid Card ID, enjoy a "Taste of Cherry Hill" compliments of local restaurants, and find out what makes Cherry Hill such a great place to live, work and play! The event is free, but registration is requested. For more information or to register, click here. It's almost time for the 2013 Art Blooms Earth Festival, presented by Cherry Hill Township and Sustainable Cherry Hill. This free, daylong event celebrates our commitment to educating and engaging the public on sustainability, health and wellness, and much more. Events include a family-fun bike ride, free e-waste recycling, local entertainment, green vendors and crafters, delicious food, nature walks, and a very special appearance by the Phillie Phanatic! The event runs from 10 a.m. to 2 p.m., rain or shine, on the grounds of Croft Farm, 100 Borton's Mill Road, and is the kick-off to Art Blooms 2013. Look for much more information in the weeks to come; for details, click here. There are just two opportunities left to take advance of free tax-preparation assistance being offered to seniors through a partnership between the Township and AARP. Sessions will be held from 10 a.m. to 2 p.m. next Tuesday, April 9, and Friday, April 12, in the N. John Amato Council Chambers (Room 208) at Town Hall. No appointment is necessary, however, spots fill up fast, so arrive early! Preparing your tax return can be a daunting task; please take advantage of this valuable service! For more information, click here. It's supposed to be a beautiful weekend in Cherry Hill, so come out and get your hands on history with a free open house this Sunday at Barclay Farmstead! From noon to 4 p.m., enjoy guided tours of the 19th century Quaker farmhouse, complete with a "tin punch" craft activity from 1-3. Be a “tinsmith” and create a framed, punched tin craft while learning about the important Early American trade. Enjoy a walk of the 32-acres of park land that includes farm outbuildings, herb garden, playground and nature trails. Can't make it this weekend? 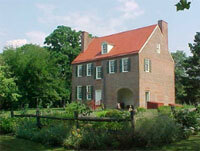 The farmhouse is open for public tours the first Sunday of every month from March to November. For more information, call (856) 795-6225, or e-mail info@barclayfarmstead.org. The Cherry Hill Public Library will host a blood drive for the American Red Cross, from 2:30 to 7:30 p.m. Monday, April 15, in the lower-level conference center. In just 15 minutes, you can save up to three lives! If you are in good health, at least 17 years old and weigh at least 110 pounds, please consider rolling up your sleeves and donating. Walk-ins are always welcome, but appointments are preferred. For more information or to register, call Katie Hardesty at (856) 903-1207, or click here. On Wednesday, members of Council and I announced that the Township hopes to participate in the upcoming auction to purchase the bankrupt Woodcrest Country Club. This 155-acre parcel of undeveloped land is an important piece of our community and should be preserved in perpetuity as open space. The Township has reached out to the Camden County Board of Freeholders requesting their assistance in helping to secure the funds needed to put forth a competitive bid for the property. Regardless of whether we emerge as the winning bidder, Council and I want to stress the fact that we do not, and will not, support a change in zoning from the property's current institutional designation. 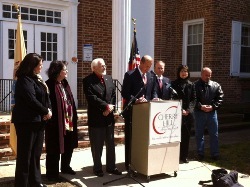 Read all about Wednesday's announcement, including the full text of a letter sent to Woodcrest and adjacent neighborhoods this week, by clicking here [http://www.cherryhill-nj.com/CivicAlerts.aspx?AID=229] . If you recently moved into Cherry Hill, or if you just want to meet new people and learn more about services and activities available in the Township, please join us for a very special "Welcome to Cherry Hill" open house, from 6 to 8 p.m. Wednesday, April 10, at the Cherry Hill Public Library. Council and I will be on hand to meet attendees, and information will be available on Township services, community groups, places of worship, athletic organizations, swim clubs, and much more. Special presentations from the Library, Cherry Hill Schools, and the Police and Fire Departments are scheduled from 6:30 to 7 p.m. Meet your neighbors, sign your children up for a free Kid Card ID [http://www.cherryhill-nj.com/index.aspx?nid=516] , enjoy a "Taste of Cherry Hill" compliments of local restaurants, and find out what makes Cherry Hill such a great place to live, work and play! The event is free, but registration is requested. For more information or to register, click here [http://www.cherryhill-nj.com/index.aspx?nid=516] . It's almost time for the 2013 Art Blooms Earth Festival, presented by Cherry Hill Township and Sustainable Cherry Hill. This free, daylong event celebrates our commitment to educating and engaging the public on sustainability, health and wellness, and much more. more. Events include a family-fun bike ride, free e-waste recycling, local entertainment, green vendors and crafters, delicious food, nature walks, and a very special appearance by the Phillie Phanatic! The event runs from 10 a.m. to 2 p.m., rain or shine, on the grounds of Croft Farm, 100 Borton's Mill Road, and is the kick-off to Art Blooms 2013 [http://cherryhillarts.blogspot.com/] . Look for much more information in the weeks to come; for details, click here [http://www.sustainablecherryhill.org/get-involved/earth-day-festival/] . will be held from 10 a.m. to 2 p.m. next Tuesday, April 9, and Friday, April 12, in the N. John Amato Council Chambers (Room 208) at Town Hall. information, click here [http://www.cherryhill-nj.com/CivicAlerts.aspx?AID=218] . It's supposed to be a beautiful weekend in Cherry Hill, so come out and get your hands on history with a free open house this Sunday at Barclay Farmstead! From noon to 4 p.m., enjoy guided tours of the 19th century Quaker farmhouse, complete with a "tin punch" craft activity from 1-3. Be a “tinsmith” and create a framed, punched tin craft while learning about the important Early American trade. Enjoy a walk of the 32-acres of park land that includes farm outbuildings, herb garden, playground and nature trails. Can't make it this weekend? The farmhouse is open for public tours the first Sunday of every month from March to November. For more information, call (856) 795-6225, or e-mail info@barclayfarmstead.org [mailto:info@barclayfarmstead.org] . pounds, please consider rolling up your sleeves and donating. Walk-ins are always welcome, but appointments are preferred. For more information or to register, call Katie Hardesty at (856) 903-1207, or click here [http://host6.evanced.info/cherryhill/evanced/eventsignup.asp?ID=4761&rts=&disptype=info&ret=eventcalendar.asp&pointer=&returnToSearch=&SignupType=νm=0&ad=&dt=mo&mo=4/1/2013&df=calendar&EventType=ALL&Lib=&AgeGroup=ALL&LangType=0&WindowMode=&noheader=&lad=&pub=1&nopub=&page=&pgdisp=] .